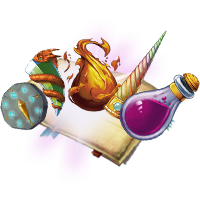 Until September 5th, create magic potions to earn prizes on Howrse! The divine released during this promo is another Zodiac divine – Virgo. In order to start making a potion, you need to unlock a recipe. You can unlock 6 recipes per day and must state what ingredients are needed for the potion in order to unlock it (recipes listed below). Once you select the right ingredients, you can create the potion if you have enough of the correct ingredients. Each potion takes a specific amount of time; potions can cook faster if boosters are used (3 boosters for 1 pass). Use objectives to earn ingredients and boosters – posted below recipe ingredients. Remember to confirm the objective upon completion to receive the prize! Ingredients can also be bought in the flash sales (click the lightning bolt, to the right of the recipe button on the promo page). Note: If you want to create a potion more than once, the number of required ingredients will double. Water Trough: 3x Snake Venom, 3x Mandrake Sap, 3x Dragon Scales. Remember you can skip an objective by donating a BM item to Ow. I’ve noticed that the magic hat is timed, but it doesn’t indicate so on the “My Prizes” list. I’ve been collecting for the Philosopher’s Stone to eventually sell on the black market, but now I am unsure if the ingredients are worth it because I don’t know if it, too, is timed. Does anybody know? Hi I was wondering if there is anyway to get the divine without using passes thank you! @Hannah: For most promotions, including this one, it’s not possible unfortunately. The next promo is the Wandering Horses and perhaps that may be easier to progress through without passes.